In a competitive global smart baggage handling system market, keen players are hard-focused on collaborations to expand their outreach and to accelerate their pace of gains. In matters of competition, the global smart baggage handling system market is expected to witness the entry of small-sized players that will further intensify competition in this market. Some of the key growth drivers of the global smart baggage handling system market are a modernization of existing airports, growth in the number of airports and air travelers, and adoption of systems with improved accuracy for baggage handling and baggage tracking. In emerging economies, construction of new airports that are equipped with state-of-the-art technology is benefiting the smart baggage handling system market. The installation of these systems enable easy tracking and handling a large volume of baggage which is critical to the growing air traffic in these regions. As per estimates of a report by Transparency Market Research, the global smart baggage handling system market will clock an impressive 19.3% CAGR from 2017 to 2025. If the figure holds true, the market’s valuation of US$1,508.6 mn in 2106 will become US$7,210.8 mn by the end of 2025. The report studies the global smart baggage handling system market on the basis of mode of transportation, technology, solution, and region. In terms of airport, the market is segmented into airport and railway station. The segments of the global smart baggage handling system market based on technology are radio frequency identification system (RFID) and barcode system. Of the two, in 2016, radio frequency identification led the market vis-à-vis revenue. This is because RFID allows the system to scan the baggage tags with negligible probability of issues that help generate a good chunk of revenue. On the basis of mode of transportation, the global smart baggage handling system market is divided into airport and railway station. The segment of airport is further sub-segmented into international and domestic. The international airport segment is expected to represent a sizeable share of the overall market over the forecast period. The segments of the market depending upon solution are sorting, conveying, tracking and tracing, diverting, and others. Geography-wise, the report studies the growth prospects of the global smart baggage handling system market across North America, Europe, Asia Pacific, the Middle East and Africa, and South America. North America is the key region for smart baggage handling systems due to a significant growth in the construction of new airports in the last couple of years. The North America smart baggage handling system market is anticipated to display a phenomenal 20.5% CAGR over the forecast period between 2017 and 2025. The U.S. currently accounts for the leading revenue contribution to the region and going forward the U.S. is estimated to rise at a significant CAGR over the forecast period. The U.S. federal government recently invested approximately US$3.7 bn to strengthen airport infrastructure. This includes installation of high capacity automated baggage handling systems to serve the need to handle large volume of baggage of varying sizes. Air carriers as well airports authority are working in coherence to deploy advanced baggage handling systems across North America. For instance, in May 2017, Delta Airlines invested US$442.3 bn to include facial recognition for passengers using self-service baggage drop system at Atlanta International Airports. In 2016, Asia Pacific stood as a key region for smart baggage handling system due to growth in the number of airports and air travelers. Prominent participants in the global smart baggage handling system market include Daifuku Web Siemens Group, Pteris Global Limited, Fives Group, G&S Airport Conveyor, Vanderlande Industries, Alstef Automation S.A., SITA, Beumer Group, and Scarabee Systems & Technology B.V. The report provides analysis of the smart baggage handling system market for the period 2015–2025, wherein the years from 2017 to 2025 is the forecast period and 2016 is considered as the base year. Data for 2015 has been included as historical information. 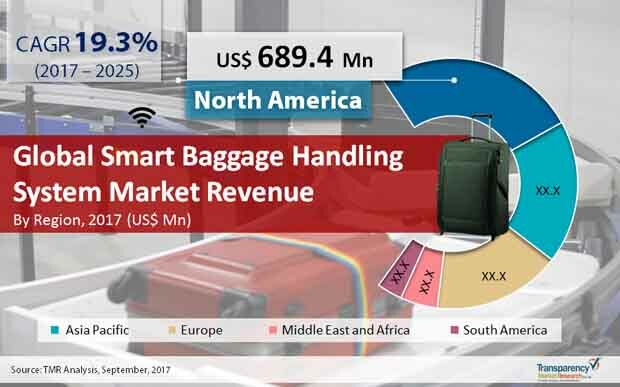 The report covers all the major trends and technologies playing a major role in the smart baggage handling system market growth over the forecast period. It highlights the drivers, restraints and opportunities expected to influence the market growth during this period. The study provides a holistic perspective on the market’s growth in terms of revenue (in US$ Mn) across different geographical regions, namely North America, Europe, Asia Pacific, Middle East & Africa and South America. Report highlights the key trends affecting the market on a global scale. Furthermore, region wise prominent countries/regions covered in the report includes - the U.S, Canada, Germany, France, the U.K., India, China, Japan, UAE, Saudi Arabia, South Africa, Brazil and Argentina. The comprehensive smart baggage handling system market estimates are the result of our in-depth secondary research, primary interviews, and in-house expert panel reviews. These market estimates have been analyzed by taking into account the impact of different political, social, economic, technological, and legal factors along with the current market dynamics affecting smart baggage handling system market growth. This report provides all the essential information required to understand the key developments in smart baggage handling system market, growth trend of each segment and strategy of each company that helps them to efficiently compete in the market. Also, the report provides insights related to trends and its impact on the market. Furthermore, Porter’s Five Forces analysis explains the factors which are currently affecting the smart baggage handling system market. The market overview section of the report demonstrates the market dynamics such as the drivers, restraints, opportunities, trends that is expected to influence the current nature and future status of this market. Key indicators mentioned in the report, provide a robust view about the vital factors that led to the strong adoption of smart baggage handling systems around the globe. The key indicators also provide significance of the factors which are capable of changing the market scenario. These indicators are expected to define the market position during the forecast period. An attractiveness analysis has also been provided for every segment in the report, in order to provide a thorough understanding of the overall scenario of smart baggage handling system market. Moreover, the report provides an overview of various strategies adopted by the key players present in the market. The report also includes key industry developments covering significant advances made by leading market players over the period of time. The report segments the market on the basis of type of transportation, technology, solution and region. The transportation mode segment includes airport and railway station. Airport segment includes two sub segments which are international and domestic. Technology segment is divided into barcode system and radio frequency identification system (RFID). The solution segment includes sorting, conveying, tracking and tracing, diverting and other. The report also highlights the competitive landscape of the global smart baggage handling system market, thereby positioning all the major players according to their presence in different regions of the world and recent key developments initiated by them in the smart baggage handling system market. Daifuku Web Seimens Group, SITA, Vanderlande Industries, Beumer Group, Pteris Global Limited, G&S Airport Conveyor, Alstef Automation S.A., Scarabee Systems & Technology B.V., Fives Group are some of the major players operating within the smart baggage handling system market profiled in this study. Details such as financials, SWOT analysis, business strategies, recent developments, and other such strategic information pertaining to these players have been duly provided as part of company profiling.